Have you held a reasonably clean full Driving Licence for a minimum of 3 years? 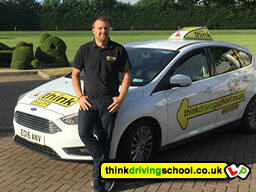 Your journey to becoming an Approved Driving Instructor (ADI) could begin here! If you pay the full course upfront it's £2750 + exam and licence costs (payable to DVSA), which gives you UNLIMITED classroom sessions, part 2 and 3 training, use of car for tests if needs be and all the books, CD'S and lesson plans you will need to be a driving instructor. If you pay as you train, in car is charged at £35 per hour + exam and licence costs (payable to DSA), Classroom sessions are charged at £10 per session, lesson plans etc are available please enquire for price, and sessions are a minimum of 2 hours. Call us if you would like to discuss the options, we are quite happy to give you a two hour assessment so we can give you a idea of your ability and your needs, so we then can decide which option is best for you, if you decide to take the full course the £70 fee for the two hours will be taken off the cost of the course. Your training can be done at your convenience, you can book your training sessions with your trainer like a learner books there lessons at a time and place that is good for you. Or you can come along to our training days if they fit into your schedule. So no taking extra time of work to fit us in, we can train you around your timetable. Feel free to call us on 0800 6123 566 if you have any questions on this or any part of our training program. Our flexible training program will prepare you for your exams, but also get you ready for the world of driving instruction. Pupil retention, diary management and being safe on the road with a learner. All very important to being a successful Approved Driving Instructor, and are important factors in keeping your earning high and your reputation higher. Think do not charge for Training for Part 1 as its a self study test, as all the books and CD's you will need are readily available from the Driving Standards Agency (DSA) or the Stationary Office (TSO). We will advise you on the most suitable books to get. We are always available for a chat over the phone, call/email to guide you through this stage. Whilst you get started on Part 1 home study we will start training you for part 2 and 3 which will help you with part 1 as many of the things you come across will become clearer as you start to do them. In your practical Part 2 and 3 sessions. • Arrange for a Criminal Records Check (DBS) - instructions are online on the link above. If you have points on your licence you will need to check the procedure with the DVSA. • Apply to DVSA for registration - all information is on the link above for this. • Take Exam – 100 multiple choice questions & a Hazard Perception Test which is completed on computer. Feel free to call us on 0800 6123 566 if you have any questions on this or any part of our training program. • Study/Practice - this can be anything from 4hr to 15/20hrs. • One hour Driving Test, this is tested at a very high standard (only 6 Driver Faults allowed, and doing 2 manoeuvres). • Part two training charged at £35 per hour. Unlimited training included if you pay for whole course. • Study/Practice - training on this part will take at least 40 hours, and will also entail a vast amount of private practice at home (60 hours if you want to take advantage of the pink license). • Take exam - a one hour practical exam on your ability to teach. • Part three training is charged at £35 per hour. Unlimited training is included if you pay for whole course. There are several ways in which we will train you in order to prepare you for the final part of the exam, these will include; role play with pupils at different levels and on various subjects, coming in and out of role to help you understand how to teach your pupils. We will get you to observe us teaching our learners, so you can see real world teaching. If you decide to take the pink licence option we will also watch you with your own learners and provide you with useful tips to enhance your teaching style. This will help you to get used to having someone watch you on test day but also helps us see how you are getting on in the real world. Then give you advice and ideas to go forward with your teaching. For your final exam you take a real learner to the test centre and give them an hour long lesson on a subject that is relevant for the student you decide to take. When you learn with us you will be learning for all three exams from the beginning, there is no waiting to pass one exam before moving onto the next. Being able to drive for your Part 2 exam, is easier if you understand the WHAT – WHY – HOW of it all, so in learning to drive to a part 2 standard you will also be learning how to teach and the reasons why we do things, so you can put them into practice. This is why learning for all 3 exams from the outset will help you pass them all. Once you have qualified as an ADI you will be invited to attend a Standards Check throughout your career. Although experience gives us the confidence that we have met most common situations before, we often get comfortable in the job using the methods that have got us through over time. Before to long if we are not careful we can tend to get stale, using outdated methods and worn out teaching practices that are not up to the present demands of the job. This is the most frequently stated fear when the experienced ADI is asked to present him or herself for a DSA Check Test. We can give you up to date relevant Standards Check training which will not only get you through your Standards Check, but you should feel confident that you will get a good grading and become an even better driving instructor. Check test training is charged at the same rate as part 3 training £35 per hour. Whilst you are receiving standards check training from us you will also be able to attend our classroom sessions that are usually held Monthly free of charge (usually £10). These will help you even if they are on different subjects than your planning on using. If you would like to chat to us about your needs feel free to contact Ian Weir or Douglas Edwards on 07894 988773 or 07894 988773 or send us an email via our contact page. CHECK THE TRAINER OUT BEFORE COMMITING! And Insist on meeting your trainer - not just a representative from the School. • Do you like them? • What materials do they use - do they provide lesson plans for instance? • Are they flexible with timings? • Can you sample the training first at an hourly rate with no commitment?